The G.H.C. 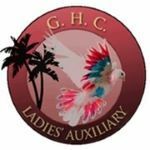 Ladies' Auxiliary is a social organization associated with the Gulfcoast Homing Club (the G.H.C.) in Spring Hill, Florida. We provide a social outlet for women who are affiliated with a flyer or who are female members of the G.H.C. themselves. We also support and assist the G.H.C. during race seasons, auctions, the Classic,and other special events.